Jewelry Trends… and Myths – Valentine’s Day is just for women. Not so. Men like to be chased by cupid too, and surprised with sweet notes and chocolate, jewelry and even flowers. And why should they be left out anyway? A Valentine gift or note is between two people. Your guy may be the archetypal cowboy (and there is nothing wrong with that), but you can be certain that a special token of your affection will warm his heart and make his knees wobble. Everybody deserves to feel special. More Jewelry Trends – Due to its shape, the ring, or circle, has long been a symbol of eternity. Like time, it has no beginning and no end. Even its empty center has significance; it represents not a void, but rather a doorway or portal. Thus the significance of the ring as an ornament that symbolizes, and in fact seals, the union of two individuals. Meanwhile, at the Workbench – Fashioning a nesting place for diamonds, from blue wax to smooth, solid silver. 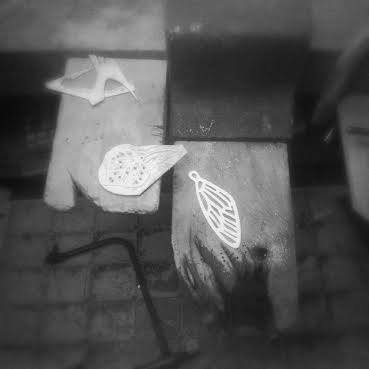 At The Workbench, A Few Days Later – Prototype wings and a thought: Is it possible for personal ornaments to not be nature inspired? Isn’t everything we create inspired by nature at first, or by a need or idea that takes root in the ground, the sky, the trees and the beasts? And The Poetry Of Love – “Many are the starrs I see, but in my eye no starr like thee.” This is an English saying that used to be engraved on poesy rings. In France and England, between the 15th and 17th centuries, women were offered a “Posie ring” as a symbol of their engagement to a lover. These rings did not bear a gemstone. They were bands with an inscription on the outside, and later hidden on the inside. The word “Posie” is thought to be a variation of “Poésie,” the French word for Poetry.